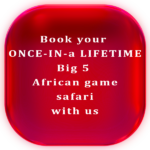 Join us for an amazing safari adventure. Tucked away at the foot of the world famous Brandwacht mountains in a peaceful rustic environment near Cape Town, this African Big 5 Game Reserve is surrounded by Proteas and fynbos vegetation and not only offers game drives and bush safaris. At Fairy Glen Game Reserve you will experience a very intimate and personal encounter. This means you will get close – so close that you will, without doubt, get great photos, and a close up view of our animals. Fairy Glen game have stories, which we love to share, and this brings the experience closer to your heart. Although we have the Big 5 - the Mountain Leopards roam free in the mountains at Fairy Glen, and are rare to see, as they mostly hunt at night. We have very experienced game ranger/guides who will take you on a game drive or horseback safari. They are all intimately involved with the animals, and will answer all your questions about Fairy Glen and the game. You will have ample time to observe the animals up close. Stay overnight and hear the lions roar in the evening and early morning, an experience you will never forget as long as you live. Experience our game intimately. Enjoy a nature walk up to the Dam wall - a very comfortable walk and worth seeing. Fairy Glen is committed to improving the reserve as well as your experience. Fairy Glen is Cape Town's closest mostly free-roaming Big 5 game reserve. Fairy Glen is a must see if you visit Cape Town and want to see our Big 5. If you visit Cape Town, this is the perfect place to stop or stay over and eventually leave with only beautiful memories. Fairy Glen Big 5 safaris was awarded the Best destination winner for exhibition excellence in the category Game Lodges, B&B, Guesthouses, Hotels and Resorts. Bucket list stuff! The name Fairy Glen originates from a very large Dragonfly which was found from time to time in their natural habitat in the valley mountain streams, known as Fairy Glen. The African style restaurant serves mostly traditional food and caters for vegetarian and vegan guests. Overnight guests can choose between Standard and Luxury chalets. Fairy Glen provides job opportunities to the local community, the previously disadvantaged and is a proud sponsor of the Institute for the Deaf as well as the Institute for the Blind. All mattresses in our accommodation were made by the Blind. Fairy Glen private game reserve is tucked away at the foot of the world famous Brandwacht mountains, in a peaceful and rustic environment near Cape Town. This African Big 5 game reserve is surrounded by Proteas and Fynbos vegetation . The name originates from a large dragonfly found in their natural habitat in the valley mountain streams, known as Fairy Glen, and is home to an African Khoisan Bushmen Rock Art Heritage Site dating back some 6,000 years.